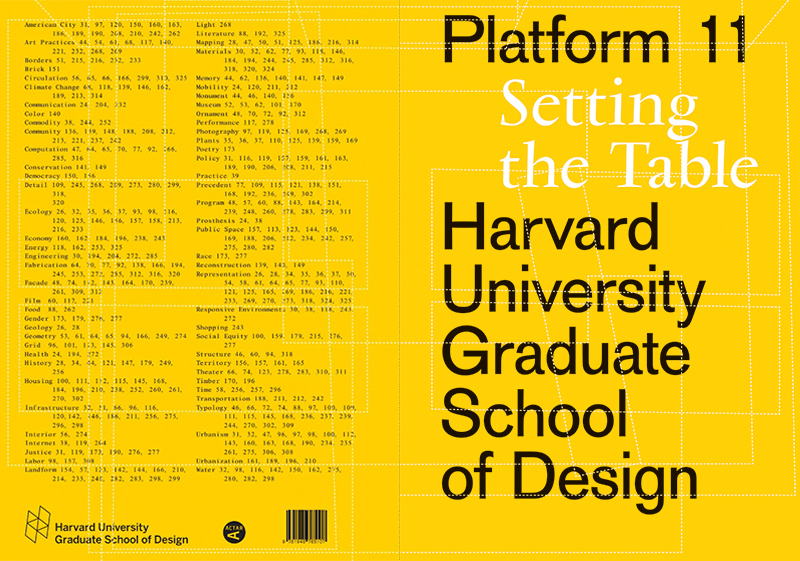 Platform represents a year in the life of the Harvard University Graduate School of Design. Produced annually, this compendium highlights a selection of work from the disciplines of architecture, landscape architecture, urban planning and design, and design engineering. It exposes a rich and varied pedagogical culture committed to shaping the future of design. Documenting projects, research, events, exhibitions, and more, Platform offers a curated view into the emerging topics, techniques, and dispositions within and beyond the Harvard GSD. In Setting the Table, the first student-led installment of the series, editors Esther Mira Bang, Lane Raffaldini Rubin, and Enrique Aureng Silva assemble a diverse body of work and cut it up—reinterpreting, rearranging, and ultimately composing a poetry revealed in each retelling. 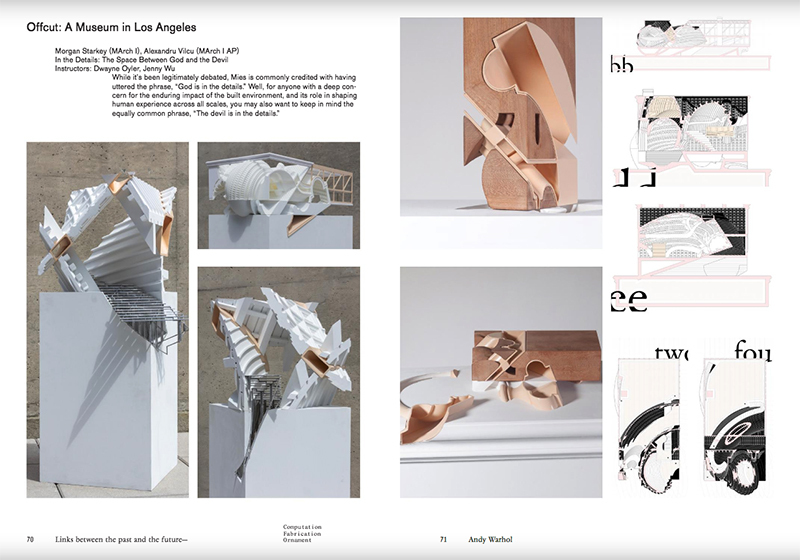 Traditionally, the end-of-year journals that come out of architecture schools – be it Harvard GSD or some other university, Ivy League or otherwise – partition the various projects, lectures, publications, and other output produced by students, professors, and visiting academics. 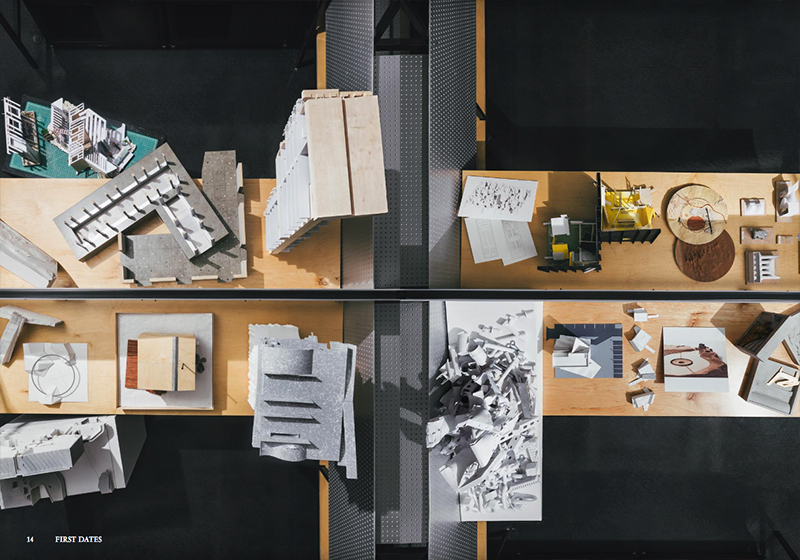 So thesis projects by Master of Architecture students, for instance, are in one place, while third-year landscape architecture projects are in another place. Lectures and other events are often stuffed into the back matter, so as not to distract from the student work. This sort of thing is the norm, allowing certain types of projects to be found easily and enabling outsiders to see a school's output as a gradient: from first to last year, from introductory to mastery. But architecture school isn't so well ordered. Classes may move in such a direction, but the activities taking place within them can border on the chaotic, no matter how much order takes place behind the scenes or how much structure is instilled in students so they get their work done on time. 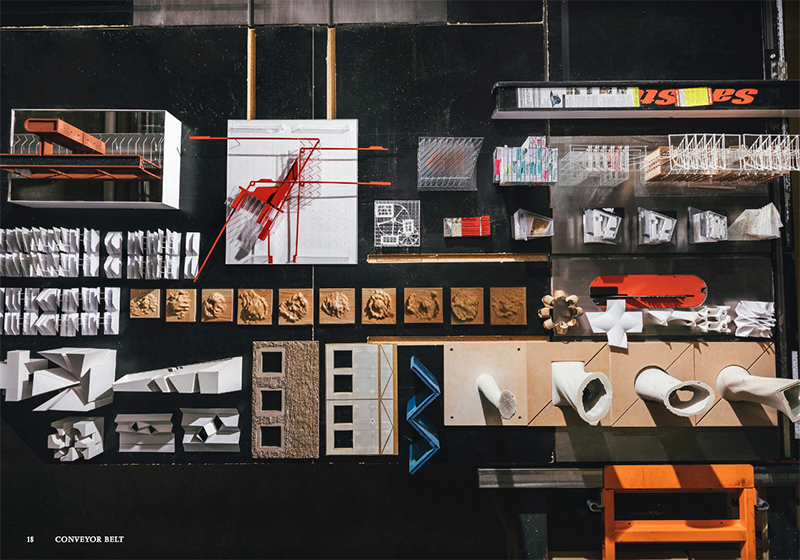 Collage is one way to capture the lovely chaos of architecture school, and that is the approach Esther Mira Bang, Lane Raffaldini Rubin, and Enrique Aureng Silva take in the latest year-end Platform for Harvard GSD. 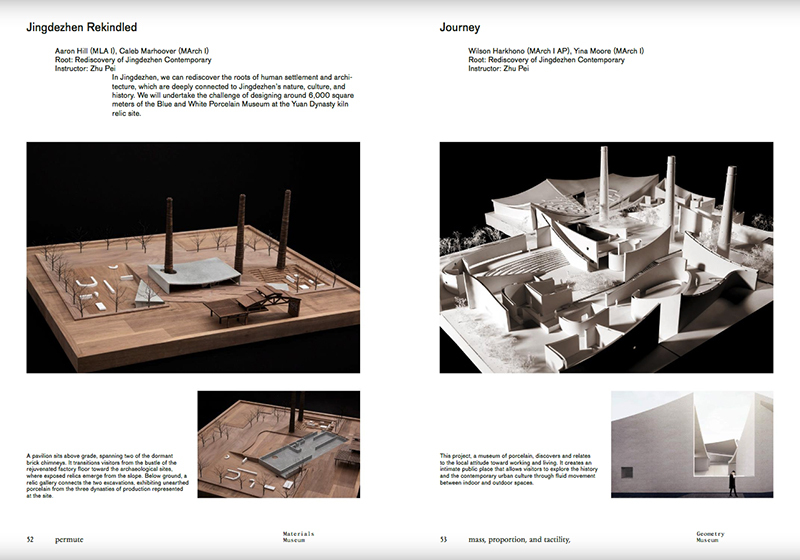 The book starts with aerial photographs of architectural models assembled on tables: Projects with no relationship to other sit side by side, juxtaposed in a manner that reflects the structure of the book and the mixing of students within the famous "trays" of GSD's Gund Hall. Studio projects, lectures, exhibitions, and publications are given one or two pages, following one after the other in apparently random order. There are chapters – sixteen of them – but they exist to break down the book's nearly 400 pages, serve as canvases for collaged poems drawn from student projects, and allow for some variety, such as with the inverted pages in the "Turntable" chapter (what I thought was a printing error at first glance). The models, drawings, and renderings throughout are very much of their moment, with a liberal use of color, a heavy reliance on Photoshop, and an embrace of Postmodernism. Ultimately the imagery expresses the always high design quality that comes out of Harvard GSD. Esther Mira Bang, Lane Raffaldini Rubin, and Enrique Aureng Silva are the first students to direct the editorial work for an issue of Harvard GSD's annual Platform series.